Caracas, Venezuela - The Catia Theatre in Caracas, Venezuela was the stage for the 2013 FIBA Americas Championship Draw in which the participating National Teams were divided into two groups of five. Mr. Aníbal García conducted the draw, with special invitees Julio Lamas, current Head Coach of the National Team of Argentina, Flor Melendez, currently Head Coach of the Puerto Rico National Team and past players, Oscar Torres from Venezuela and Jerome Mincy from Puerto Rico. Also present were the International Basketball Federation in Americas directors, Mr. Horacio Muratore, President of FIBA Americas, and its Secretary General, Mr. Alberto Garcia, along with President of the Venezuelan Basketball Federation, Mr. Carmelo Cortez, the President of the Dominican Basketball Federation, Mr. Rafael Uribe and the People's Minister for Sport, Mr. Hector Rodriguez. Grupo A – Uruguay, Puerto Rico, Cánada, Jamaica, Brazil. Grupo B - Mexico, Dominican Republic, Venezuela, Paraguay, Argentina. 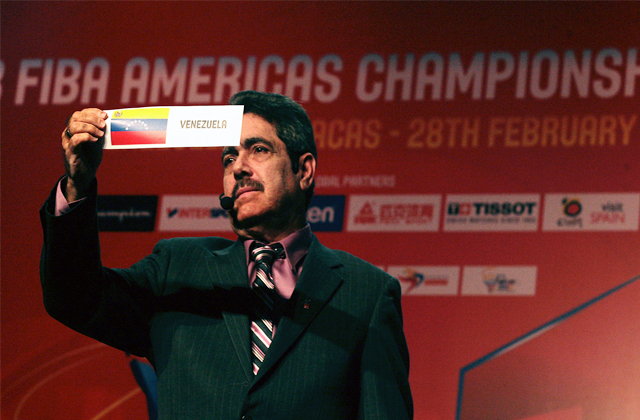 The 2013 FIBA Americas Championship will be played in the Poliedro of Caracas, Venezuela from August 30 to September 11, and will classify four national teams to the 2014 FIBA World Cup in Spain. The last FIBA Americas Championship was played in Mar del Plata, Argentina in 2011. The host team won the championship with the “Golden Generation” that featured the likes of Emmanuel Ginobili, Luis Scola, Carlos Delfino and Pablo Prigioni. The Championship also had international stars such as Marcelo Huertas and Tiago Splitter (Brazil), Al Horford (Dominican Republic), Jose Juan Barea and Carlos Arroyo (Puerto Rico) and who now will host the event, Venezuelan Greivis Vasquez.